Am I an ABA Evangelist? I get accused sometimes of being an ABA (Applied Behavior Analysis) proselyte. Most typically by people who don’t know me or my professional field. As a neuropsychologist, I’m really clinically involved in autism on the “front end” — I diagnose kids and develop treatment plans. Because I run my autism program, I get to also use that as a means to drive therapy and hold it accountable. 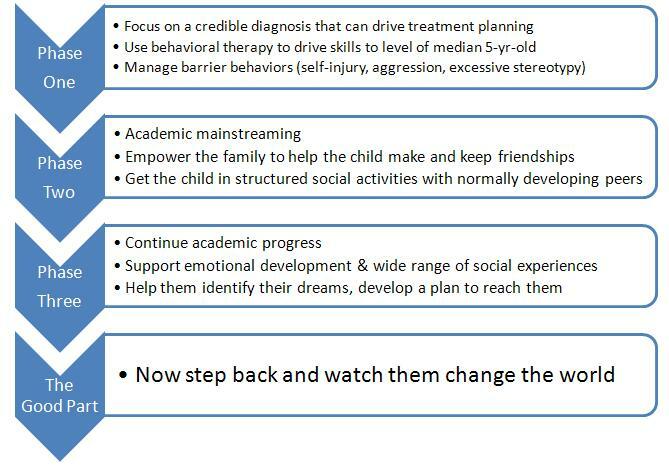 I don’t just evaluate kids and recommend therapies and never see them again, but rather I re-evaluate them, typically annually, to determine if they are growing and gaining skills, to determine if new approaches are merited by new problems or challenges at a new level of development, and to give the family a central collaborator in myself to help their child thrive. When I do that, I integrate a variety of approaches — for young children with autism, I almost always recommend a behavioral intervention, whether ABA, PRT (often if ABA cannot be accessed), or family therapy (typically when skill level of the child is higher). Our early intensive behavioral intervention (EIBI) program is the go-to route for children who are below age level in social/functional communication skills, self-care skills, play skills, or other developmental skills in the context of autism, but I don’t just “throw” children into it without thinking carefully. In our approach, I don’t recommend speech & language pathology, family psychotherapy to aid in friendship development, or other in-clinic services until children are at a threshold level of skill (typically I will talk about these therapies once children are around the verbal level of the mean normally developing five-year-old, based on the logic that many group activities for children, including formal schooling, are designed for children starting at about this level). I will also consider medical diagnostics a family and their physician should consider (MRI, EEG, genetic testing/consultation), dietary or other complementary interventions, academic recommendations, and informal things the family can do at home. I rarely recommend medication before age five years, but after that I will recommend medications where appropriate, largely following the kind of guidelines in this practice parameter. In this context, ABA-based interventions like the EIBI package are my go-to behavioral intervention because they’re the most effective. I’m not a behavior analyst, although I am an affiliate ABAI member. Let me be clear that I choose ABA for my kids because it has the evidence, and because the evidence from large scale trials correlates closely with the evidence we see in our own clinic of children making dramatic gains (like the boy I mentioned here). And it does so without a lot of side effects (this is a topic for another blog, but our children have fun in our EIBI clinic… anyone who wants to know more about this is very welcome to buy a ticket to Grand Rapids, MI and see for themselves). Let me also be clear that ABA is not a wonder drug. Even very famous people tried it for the wrong things with disastrous results. Dr. Ivar Lovaas, the man who proved our kids could make double digit IQ gains and go from a 2% chance of mainstreaming to a 50% chance via 40 hours a week of intensive behavioral therapy, also tried to use ABA to “cure” children of unacceptable gender identities, with now unsurprisingly disastrous results. Moreover, if something does come along that out-performs ABA, you can bet that I will know about it before almost anyone, and that I will actively be planning to implement it in my programs and deliver it to the children who’s autism care I manage. Because my job is to help them thrive absolutely the best that they can. In the meantime, my question is, why is anyone doing anything different? Why are there diagnosticians who work with children with autism who think that “good” practice is to prescribe them Risperdal, note every three months that they’re doing “well” (while they can’t hold a conversation and aren’t learning anything in school)? Why are there clinicians who put children with autism in other therapies (whether Floortime or Auditory Integration Training) as first-line therapeutic options because they “like” them? What on earth would make a clinician think that what they “like” or “don’t like” trumps the evidentiary basis? I’m not a proselyte of ABA. It fits into a larger package for me. For young children with autism, who have limited skill acquisition and significant behavioral barriers to learning, it does better than anything, as monotherapy. If the children are aggressive, medications can help. If they are school age and learning, medications sometimes also help, particularly if they are dysexecutive in neuropsychological testing. If they are above a five year old’s verbal level, I’m thinking about getting them into team sports, martial arts, theatre or dance, and I’m thinking about giving their parents tools to help them make and keep friends. I’m thinking about getting them in our Puzzle Partners informal social supports programs, once their teenagers. I’m thinking about getting them through college and into professions. But given the current state of the art, I think it’s completely absurd to be doing this without ABA, and until something better comes along, I shan’t dream of it. ← Do Social Networks Drive Autism Underemployment? What do you consider ABA? I used the word lists in Catherine Maurice's book, “Behavioral Intervention for Young Chidren with Autism”, but I didn't use any behavioral intervention, if that makes sense. No “look me in the eye” or “sit at your desk” or “do this”. Maybe my son was a lot milder than your students. I did this for a couple of hours a day at age 3 for a year, and always tried to remember to “show” rather than “tell”, as it is a language disorder… By 4th grade he was no longer echolalic, which was how he taught himself language. I worked at an ABA residential school for kids with severe problems. They had no language lesson, it was all DTT. The kids didn't have to take any responsibility for their behavior it seemed. Sorry – somehow your comment got caught in my spam filter and I just noticed it! Thank you for your comments. The very basic principles of ABA are very basic principles – reinforce things we want to get more of them, remove reinforcement for things we want less of. But you ask a great question – the term ABA gets thrown around and there is a lot of confusion about what constitutes an efficacious ABA intervention. We use the applied verbal behavior model – this is why we emphasize tools like the ABLLS-R and VB-MAPP. This does mean that communicative behavior is at the core of our approach, and our emphasis is first on developing these skills and second on managing behavioral barriers to development of these skills. I don't know, however, that I'd go as far as saying autism is a language disorder. Many children with autism do not have superior nonverbal skills, and conversely, from the standpoint of vocabulary, verbal reasoning, or verbal memory, many autism children are as strong as or stronger than peers, while still clearly having autism. Our verbal behavior approach still works on the social and play verbal skills these kids frequently lack. As far as DTT is concerned, some people achieve amazing results with DTT (and with Lovaas or CARD kids are clearly gaining skills with this approach), but I agree, one thing we see as an advantage of AVB is the emphasis on skill development.